Dusky grouper stew is among the classic Skopelos traditional recipes. So it would be pretty smart to taste it while holidaying in the island –there is a good chance you will not be able to find this great recipe anywhere else in Greece! Dusky grouper fish –known as “Rofos” by the locals, is usually found in the Mediterranean sea and North Africa coast. As the Skopelos island’ locals say, it just might be the fish with the best taste of all Mediterranean! Most chefs tend to fry or bake it yet when you see Dusky grouper fish stew, you really know you are about to experience an one-of-a-kind recipe. Read here our Dusky grouper fish stew recipe and enjoy one of the most precious Skopelos traditional recipes. First we peel a couple of onions and add them to a casserole while seasoning with salt, pepper, oregano and some extra virgin olive oil. Next, we add sour plums and a glass of water and bring it to boil (boiling should last for about 40 minutes). When the mix is ready, we place a portion of it in a baking pan, add the Dusky grouper fish and top it with the rest of the mix. We place the baking pan in the oven at 200C for about an hour. When the fish is cooked, we place it on a plate and serve it hot. Allow yourself to enjoy a unique gourmet experience today. 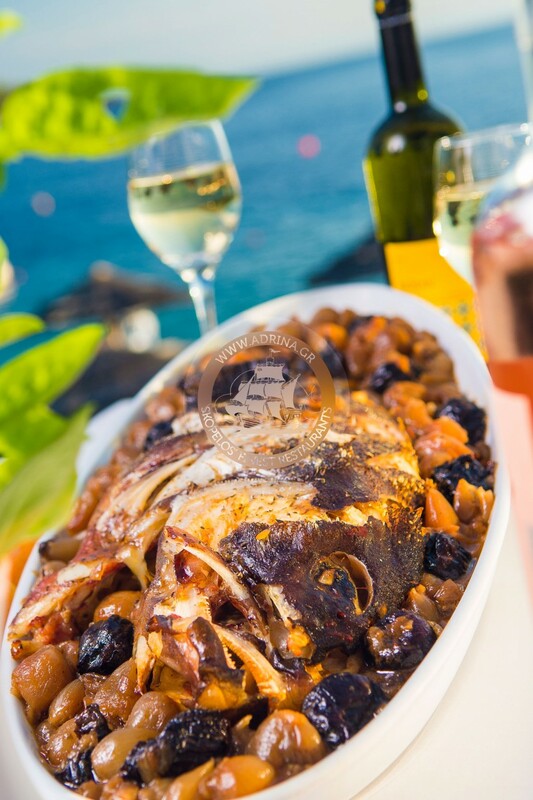 Order Dusky grouper fish stew and uncover your newest favourite of all Skopelos traditional recipes.